To Korea, Turkey means more than one of the countries located in the Middle East. There has to be a reason why Turkey has been so widely called “a brother country of Korea,” and the Turks have called Koreans “Koreli.” Thus, when I was luckily given a chance to travel overseas last winter, I was instantly attracted to Turkey and was very eager to explore this country to actually see for myself that Turkey is deeply related to Korea. 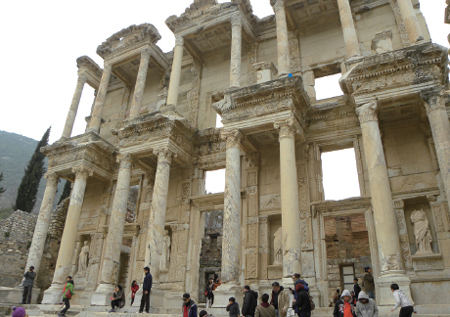 Having said that, my trip to Turkey therefore began, and I came across with much more than merely the traces of its old associations with Korea. On the first day of my trip, I landed in Istanbul, where the weather was very gloomy, and it was raining on and off. Perhaps it was such weather what contrasted the vibrant and kindly-looking faces of the Turks and made my first impression on them as very warm and welcoming people, anyhow, I was impressed by how every Turkish person I met on the streets was so favorable to Koreans. Everywhere I go, they would often come up to me and kindly say hello in Korean. Another thing that immediately impressed me as I began looking around the city was that there were tons of centuries-old ruins everywhere, even on the roads. Turkey actually has more ruins of Rome than Italy and Greece, and since there are simply too many ruins remaining, it was quite interesting how those ruins almost seemed as troublemakers; they could not move or get rid of those ruins on the roads so they just made roads around the ruins. Istanbul, the city I stayed in during my first and last day of the trip, used to be the capital city of the Ottoman Empire and is now the biggest city in Turkey. Although the current capital city of Turkey is Ankara, Istanbul is the practical capital city as both President and Prime Minister of Turkey are in Istanbul. The city is also the place where Europe and Asia literally connect, as the western area of Bosporus Str. belongs to Europe while the eastern area is considered to be in Asia. 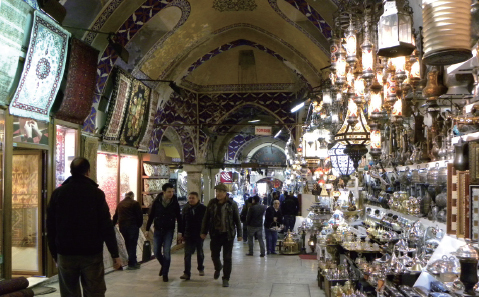 In Istanbul, I first went to the place called Grand Bazaar, -meaning “a market with a roof” -the biggest Turkish traditional market which used to be the mecca of trade that involved all kinds of both European and Asian products. 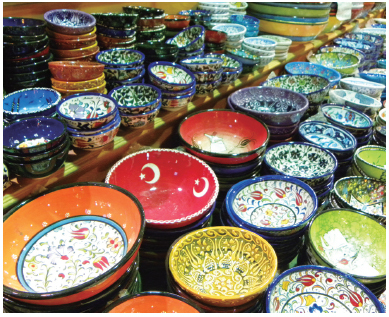 From rugs, leather, plates, ceramics to clothes and jewelry, there is nothing that cannot be found at those 5,000 stores in Grand Bazaar. It was a great joy just to see those lights and hand mirrors very delicately painted and decorated with lots of colors, but it was also nice to have the chance to look at the daily lives of the Turks and experience the modernized Turkey at this very vibrant place. On the second day of my trip, I headed to Hippodrome. Topkapi Palace, Sultan Ahmed Mosque, more commonly known as Blue Mosque, and Hagia Sophia Museum can all be found just beside Hippodrome, and all of these together are titled, “the UNESCO World Cultural Heritage Site.” Istanbul, since it has served as the capital city from the Ancient Greek, Roman to Ottoman Empire era for over 1,600 years, is especially highly abundant of such historic ruins and there are nine more places titled the UNESCO World Cultural Heritage Site in Turkey. Hippo - meaning “horse” - drome, which used to hold chariot races, extending 540m in length and 180m in width to fit a million people, was also a place where Nika insurrection arose in A.D. 530. Around 1,500 years ago, at this very place where I was standing, more than 50,000 peasants once brought about a revolt against Justinianus and cried out “Nika (‘Nike,’ meaning ‘victory’)” but were all killed by Justinianus. The traces of Nika insurrection are hard to find and there are only Theodosius Obelisk, Spiral Column and Constantinople Obelisk remaining in Hippodrome. It was raining even harder as I was looking around Hippodrome, which looked even gloomier as the sound of rain falling was alone filling this vast and empty area. Walking along Hippodrome, I encountered Sultan Ahmet Mosque and Hagia Sophia Museum, each of which can be found on both ends of the streets just by Hippodrome. It was interesting how these two were so delicately located just a block apart facing each other, yet what they represented was completely the opposite; Sultan Ahmet Mosque is an Islamic mosque, while Hagia Sophia Museum is a catholic church. Nonetheless, they say that when you are in Istanbul, you must visit both Sultan Ahmet Mosque and Hagia Sophia Museum regardless of what. Sultan Ahmet Mosque, more commonly known as Blue Mosque since its interior is made of blue tiles, was originally built to beat Hagia Sophia after the Muslims have taken over Turkey. It is now regarded as the greatest mosque that represents Turkey, and thousands of books and tourists talk about its breath-taking beauty. And I figured what they said was never an exaggeration as soon as I stepped inside the mosque. The walls and ceilings are embroidered with 20,000 blue Iznik tiles that sparkle with every ray of sunshine coming through the small stained glass windows in the mosque just make you become speechless. 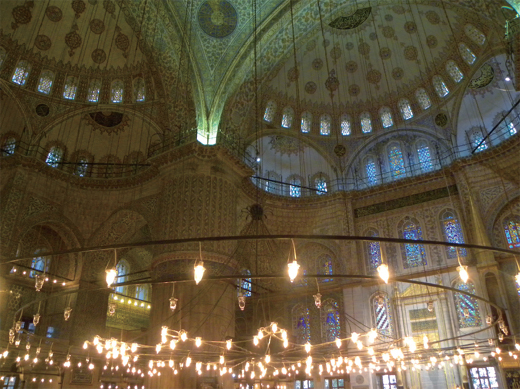 Since any figure or painting inside the mosque is considered idolization, usually there are no figures or paintings in the mosques at all, but patterns - mostly arabesque, meaning “Arabic.” In Sultan Ahmet Mosque, there are a number of decorations shaped as tulip hanging from the ceiling since tulip is the national flower of Turkey. There was, however, some great emptiness I felt while looking around this magnificent place. While churches and cathedrals give off a feeling of coziness and fullness because Christians built them perfectly to “show the heaven” to the people, the Muslims believed that nothing is perfect in this world but God, so they purposely built those mosques with a bit of “flaws” to give off a feeling of emptiness. 400 years have passed since Sultan Ahmet Mosque was built and they still take a nap, pray and carry out salat ? the formal act of worship in Islam. Walking outside Sultan Ahmet Mosque and entering Hagia Sophia, I instantly understood all of sudden why the Muslims were so desperate to build their mosque that would surpass Hagia Sophia. 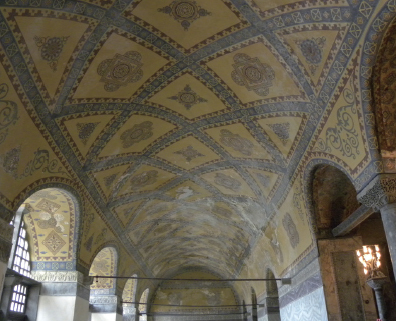 All of the ceilings and walls covered with golden mosaics, and the place was absolutely stunning and over whelming. Hagia Sophia - meaning “holy foresight” - was first built as a Catholic church, but was burnt, rebuilt and erected again, but it was again destroyed from Nika insurrection. 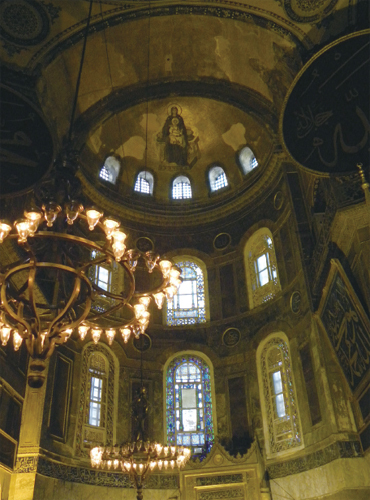 And it was rebuilt for the third time, which made today’s Hagia Sophia Museum. However, as the Byzantine Empire had fallen and the Ottoman Dynasty took over Turkey, Hagia Sophia was reconstructed into a mosque in three days. All the paintings and pictures of Jesus, and such were all covered and buried under the 5cm thick paint. 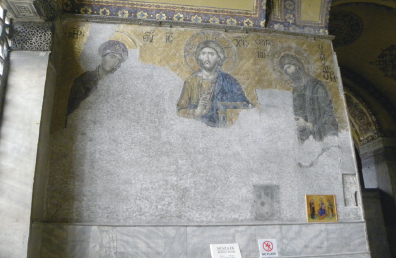 To this date, efforts in restoring the paintings are being made by the government of Turkey, but many of these paintings are already ruined a lot, and Hagia Sophia is now only used as a museum. Nonetheless, Hagia Sophia Museum still delicately shows the traces of history on both religions and attracts many visitors. On the 3rd day of my trip, I stopped at Ankara and visited Korea Park which was donated by the Korean government in 1973 to remember the Turks who have fought and perished in Korean War. Turkey was one of the 16 countries fought in the Korean War and was the country which sent the third largest number of troops to Korea. 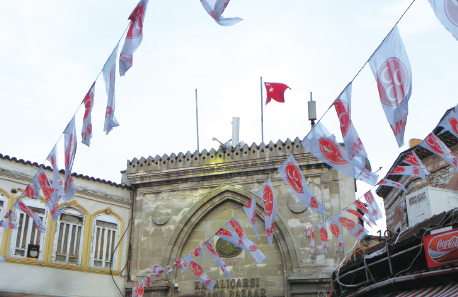 At the front gate, the Korean and Turkish flags are engraved in a row, as if they were emphasizing that Korea and Turkey are closely related as one blood. 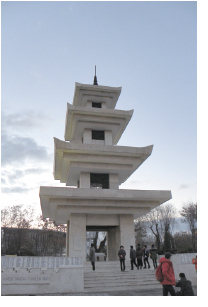 At the center of the park, the monument, which was made following Seokgatop, Korea’s one of the most representative granite pagodas, is placed. On the root base of the monument are the names of Turks who lost their lives in the war engraved. Looking at each of these names of who died from fighting for and protecting the country which, frankly speaking, had no reason for them to help, I was struck with awe, and truly felt that these people should be respected. Some argue, however, that Turkey helped Korea and sent their troops to the war so they would become a member of NATO. Nevertheless, it is a fact that thousands of Turkish soldiers bled in the war fighting for Korea and never returned to their country. The descendants of these Turks began to call the Turkish soldiers fought in Korean War and Koreans “Koreli,” saying that if their ancestors shed blood fighting for Korea, then Korea is their brother country, and Koreans are their brothers who share the same blood. And yet now, after more than 60 years have passed since the Korean War has ended and Korea has achieved remarkable development since then, the Turkish soldiers who fought in the Korean War and returned to Turkey all say that they are truly happy to see how Korea has developed so much. What struck me the most was when I heard them saying if Korea undergoes another war, they will not hesitate and fight for Korea again. And all they want from Korea in turn is hearing from us only one word: “Thank you.” But one thought I had on my mind kept bothering me: Would we, Koreans, be willing to do the same for them when the time comes? 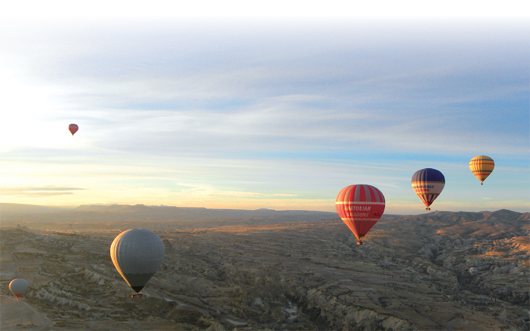 If one asks me what the best experience I had in Turkey was, I would definitely say a balloon tour in Cappadocia. The view is just so indescribably beautiful that you will doubt your eyes seeing the magnificent view laid out under your feet when you are 2,700ft high in the sky. 3 million years ago, a volcanic eruption at Mt. Erciyes and a massive earthquake gave off huge amount of volcanic ash in the area. Over time with weathering, it created those volcanic tuffs that are not so tough or hard, so they became a great shelter for Christians who had to evacuate from Rome due to the prosecution. As thousands of cave monasteries the Christians made in the volcanic tuffs still remain the same, such work made by both nature and human created a natural landscape that cannot be found anywhere else. And balloon touring Cappadocia is now one of the most popular things that people all over the world put on their bucket list. Throughout my eight days long trip, I have been to many different places in Turkey and experienced much more than what I had expected. In the end, however, what I remember the most about my trip to Turkey is, much to my surprise, the people I met there. 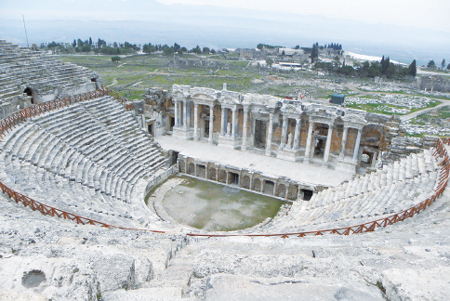 During the whole time I was moving from place to place to see each of the magnificent and exotic centuries-old ruins, I was surprised by how those ruins were so wellpreserved and was deeply impressed by how much the Turkish people must have cherished and made efforts to keep those heritages intact. Most importantly, though, what they impressed me the most was that after all those years passed since the end of Korean War, the Turkish people still value the relationship with Korea and call us their brothers, whom they would be willing to fight for again, with no hesitation at all. Tesekkur, Turkey, for making my trip full of such wonderful warm memories that I will cherish forever.